Actually, the demo was not compatible with the last saves, so no worry. (If you tried to use old saves the game will run but there will be database bugs so it won't be a good idea anyway). But what you already did won't be completly the same, I've added new things and polish so I hope restarting won't be a chore. You guys already played a lot of this game, I have to thank you for this, even doing videos of your playthrough which was really useful. This demo features twice the content of the previous one. Roughly 40 characters to play with, a world to explore the way you want, new story elements and 12 hours of gameplay. Note : The save files from the previous demos won't be compatible. I noticed that you fixed a lot of things I pointed out last time. Everything's going pretty smooth so far. The difficulty really hits hard after the second tourney--especially with a lack of healing items. I probably should follow the story line first and unlock new abilities. Went to the hideout and got trashed on by the boss there. And does Survival even do anything? I haven't seen anything happen on-map after battles yet. The difficulty really hits hard after the second tourney--especially with a lack of healing items. I probably should follow the story line first and unlock new abilities. Went to the hideout and got trashed on by the boss there. Yeah, it's kind of open at this point, you can technically do the differents "scenarios" in the order you want. I've seen players doing this hideout first by forcing through it multiple times. But, you're right, if you do other stuff first you'll level up naturaly and have more Simurions to tackle harder dungeons. Oh thanks, I missed the most obvious one. Mmh, Survival is a little hard to understand I guess. In fact, when you do battles, the Survival percentage increase from 0% to 99%. The more battles you do the higher the percentage becomes. To use the aptitude, you need to go to Aptitude/Use and choose Survival. (You'll see the percentage there). Basically, in any dungeons or places where you have battles in the wild, you can do several battles (between 1 to 10) there search for a free item. By the way, save regulary, there's still some rare and random freeze in the game, that I couldn't fix yet. Well I managed to play through it and not freeze at all, but I was also saving regularly anyway. Overall, the game is perfect I feel. It is a bit difficult at some points, but really not to bad and really the only hard part is after the first arena battle. During that time your bots are pretty weak and items cost a lot, so i died several times (only 5 in total this time according to scientist lol). However, it seems a lot more manageable than the last time i played, and I had not problem progressing. Really enjoyed the arcade, probably going to go back and finish that by getting all the optional items. One bug that I experienced (not sure if intended or not, but seems weird) after you reach the 3rd arena boss and lose, the steam in area 3 never shuts off. That means you have to walk through it to get to the final boss again, which starts you off blinded if you dont have antiblind items or skills. Just wondering if its a bug or intended to make it a bit more difficult. I also feel bad that my sister's sim was so weak XD i woulda liked to see her do something with it haha. I feel that it would be harder if she recieved atma instead of dholly but even then, her bot only has around 200 hp and my pony 1 shot it lol. Thank you very much! I have to say that you guys are really great giving feedbacks and you've followed me since quite some time, here, I'm very grateful! I'm also very happy to see that all the work had payed and the game is fun and, now, quite robust. Sometime, when you work on something for years you can't really tell if it's still good. By the way, I realised that it's impossible to have compatible savefiles through demos because how RM 2k3 works. A lot of the database is written on the savefile at the very start, so, let's say, if I change stats or skills of a Simurion it won't update correctly if you use old savefiles in newer demos. That's a shame. So for the next demos, don't feel forced to play them each year lol. Since the game is now quite long and you did the begining at least 3 times. Just wanted to tell you that. I'll update the version maybe each year or each 2 years but since it won't be finished before 2020 it's ok if you don't play each new versions. Anyway, thanks for playing!! Oh no, it's not supposed to happen. It's a bug indeed. Thanks for that. Mmh, true, I will work on this in the future. I didn't want to give it a big HP boost like other bosses since it's a forced battle and you have no way to level up (because you're stuck in the town) I didn't want to make it too difficult, but since you need to finish the 3rd arena to get there I guess it's ok to buff it a little. Just gonna list some bugs I found. - Trees near the farm. This isn't the only one, so check around that area. - Hotsprings area next to farm. - Swamp area. Seems this tree is passable from all directions. Should change that. - Wrong name for simurion. - Not sure how I got this to happen. Just showed up in my inventory at some point. Possibly when I did the remove-all in the simu-con? 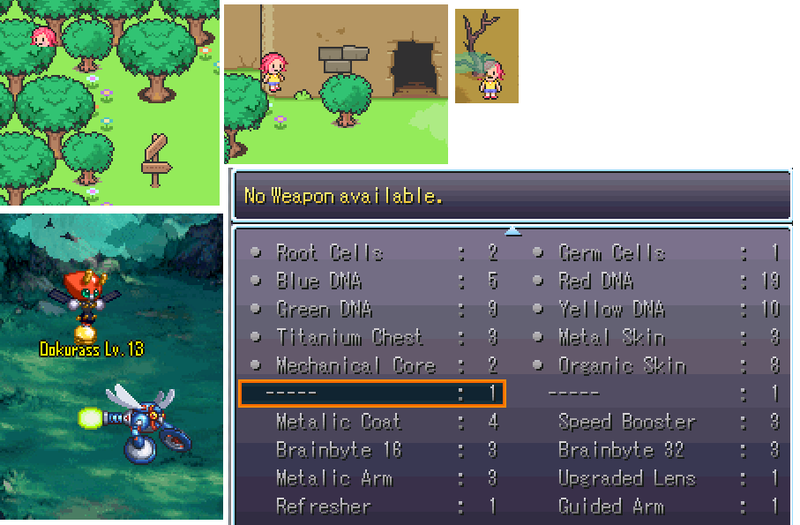 It's no longer in my inventory anymore somehow, but I was able to equip these to like Mecha or Hybrid types and couldn't remove them unless I removed them from the party. - Was sunny in Holon Plain. Simurion evolved. Suddenly raining, but BGM still playing. Encountered sunny simurions, but Water Regen still worked. Moved to another map and rain graphics stopped, but screen still dark and Water Regen still worked. Went into farm building and came out...sunny again. - Anti-Burn says "Fixes Amnesia"
- How exactly does Soul Synch work? It feels so random at times. Whole team is getting 0%, then randomly one guy gets like 40%. Then it just went back down to 0% again. - Will there be more hints regarding what stats evolve certain simurions? The Flybot one was nice. -Mushiba name and Anti-Burn description are now fixed! -Holon plain bug seems really bad, never seen this actually even when I tried to rebuild or upgrade a Simurion during sun or rain. Gotta check this. Do you remember which Simurion evolved? How exactly does Soul Synch work? It feels so random at times. Whole team is getting 0%, then randomly one guy gets like 40%. Then it just went back down to 0% again. It feels random when a Simurion is hard to catch, you're right. It should be better when you'll buff your Synchro rate with relics or items in the future, I guess. I've made a formula that is not random actually, it's in fact less random than a Pokeball in Pokemon games but luck is a lot more important when it comes to synch with harder Simurions or Simurions with HP, or both. -Synchro should be equal to 100. -First, a roll is done between 1 and 100. -Then it adds +20, +40, +60, +80 or +100 more depending of how many stuff you have to buff synch rate (the Add-on Leaves of Harmony is one of them). For most of this demo, you don't have any of these buffs, so it's mostly +0. -After this, for each type of Simurions it adds or removes to the result depending of the "synch difficulty". For instance, Mushiba has a +50 and the most difficult Simurion of this demo has a -50. -Finally, it takes the current HP of the target, divided by 5, and removes the result from the total. And this, is the Synch rate. -If you are below 100 and try again, the result won't be reset. It carries over the next try by adding itself to the next result. So you have chance to increase turn by turn your synch rate but if you have bad luck and the first random roll is very low you can reach 0 and then all progress if gone. -The synch result is 45%. If you try another time, with the same exact roll of 50 at the begining it will be 90%. And you'll get 100% at the third try. Will there be more hints regarding what stats evolve certain simurions? The Flybot one was nice. Yes, you're right to ask this, in fact, a lot of later Simurions don't have their upgrades yet in the game. Some can upgrade but maybe it's hard to find how (like Takron). If you want to know, just ask, it's not major spoiler imo. EDIT : Oops, sorry, in fact Takron upgrade is not possible in the demo. It's available juste after that. My bad. Holon plain bug seems really bad, never seen this actually even when I tried to rebuild or upgrade a Simurion during sun or rain. Gotta check this. Do you remember which Simurion evolved? I think it was Hion. Didn't record my complete gameplay, but let's just say that I was mainly trying to evolve everything and find what Simurions were good. Third tournament was extremely easy with my super team of Water types and two healers. I'm going to watch this! Oh, ys, 3rd arena can be very easy if you don't go to soon. Maybe I should make it a little more challenging. Ok, so that's a good thing! That's actually the experience I kind of want. It's been almost one year since my last update, but no worries, I'm still working on it daily. It's always a little difficult for me to explain my progress in english but I'll do the best I can. About the project progression, I would say that 70% is done (even if it doesn't mean a lot). For the first time after all these years I start to see the end of it. Sure it will still take at least 2 years to be finished but there's less and less work to do to made it! Now, let's talk about new features and stuff. If the player learns this aptitude he'll be able to use a carrier pigeon to do some shopping even when he's in the wild. The only condition is to be in the open. Call the bird, do your order and it will be back quickly. For each village the player go, the pigeon will be able to bring back new kind of items according to what the shops offer. So does it mean the actual shops would be obsolete? No, because you can only order medecine type items and not everything. This is a good support aptitude when you're in a pinch in the middle of nowhere. It's been a while since it was planned but now it's in. The first Simu-Com menu was functional but far from perfect. Thanks to DynRPG this menu will be far easier to use for the player and will have more useful informations. -The levels, types and visuals of the Simurions are now directly shown within the list. -You can browse quickly every Simurion's pages by pressing left/right. -You can change your team more easily by swaping Simurions. -The stats of the Simurion are displayed on its page. -A new description has been added for each Simurion. I've just finished a big part of the game that takes place in a snowy mountain called Kholony Peak. This is a barren area with a lot exotic gameplays where the player have to find its way to a hidden relic. Kholony Peak is constantly subjected to a snowstorm. It will be difficult to explore, if your body temperature drops below 32 ° you will lose consciousness. Keep an eye on your body temperature. This region is very large and to keep track of your progress you'll need some landmark flags. For instance, you can put a flag in front of a cave you want to explore later, or the opposite, mark the places you already visited. You can put a flag where you want on each map. Slipping ground : If you walk on a splipping ground you'll slide on a straight line without being able to move. Watch out! Ice cubes puzzle : These blocks slide forward when you push them. Stay cool to find the solution of these puzzles. This is all for now, I hope you'll like the updates. As for the demo, I won't post a new one already since the game starts to be quite long to play but maybe later this year.